Wow can you believe it it's the end of June. Where is the time going?? Make sure you use a digi as the focal on your card. 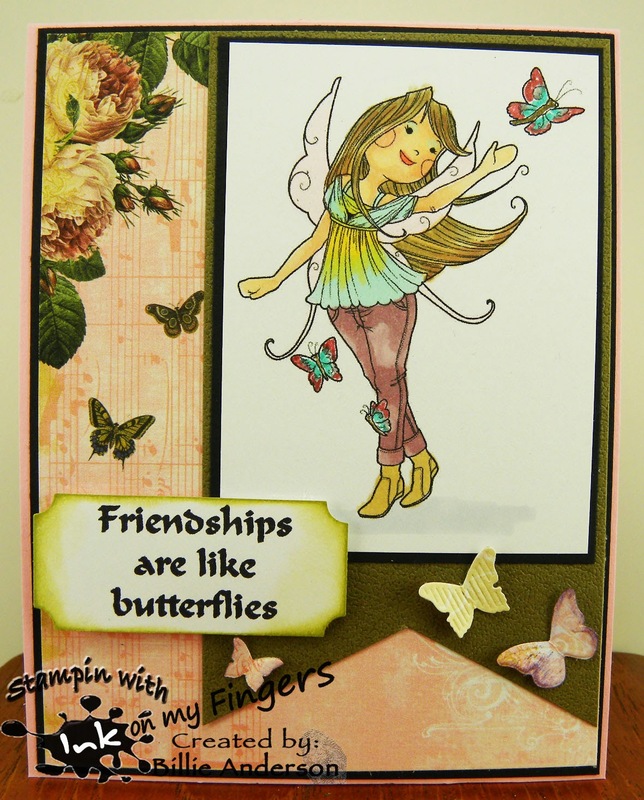 This is the card I made for the Butterfly challenge. Image is Danni Fairy. I remember chasing butterflies when I was a small child and putting them in a jar and feeding them.. so I thought. Fun memories making this card. I also tried making her jeans look bleached or gently aged. It's the style even though I don't wear them. I found this cool butterfly DP and so that helped with the butterfly theme. I added some SU die butterflies and the sentiment to finish off the card. 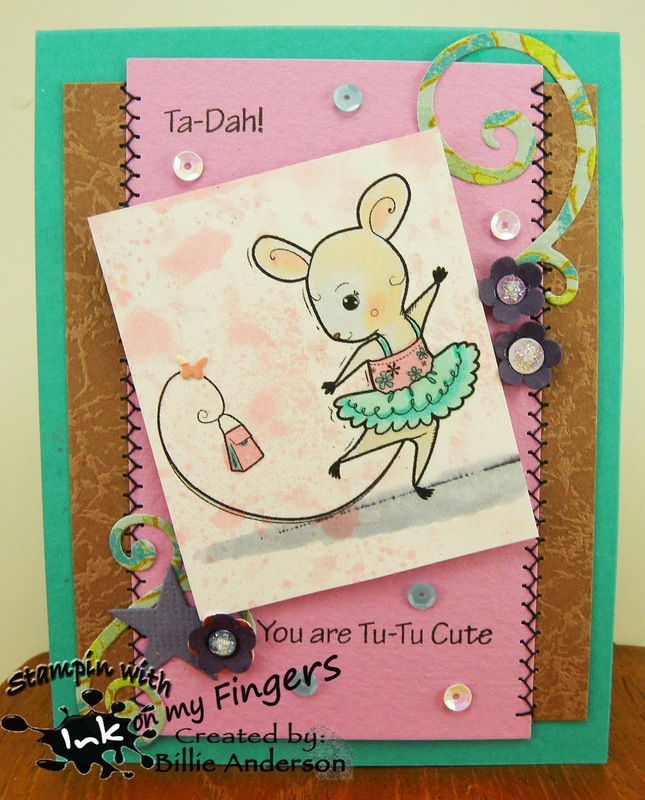 Recipe: su base, club scrap scraps, dp?, ek punch, su die, copics, sentiment?, Danni fairy pmo image. This is my card for the challenge. I love these colors and you would think it would be an easy card to make but I had issues trying to make the colors come together. I guess it's all in the image you use and I just wanted to use this cupcake mouse. He's just too cute peeking out from the frosting. 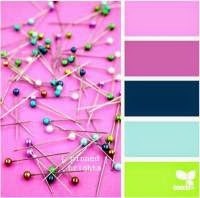 I had these little enamel dots and love them and they give more color. I heat embossed the sentiment. I layered the ribbon behind the cupcake to give a stripe look. I hope you find time to play along this week. I / we love seeing your lovely works. 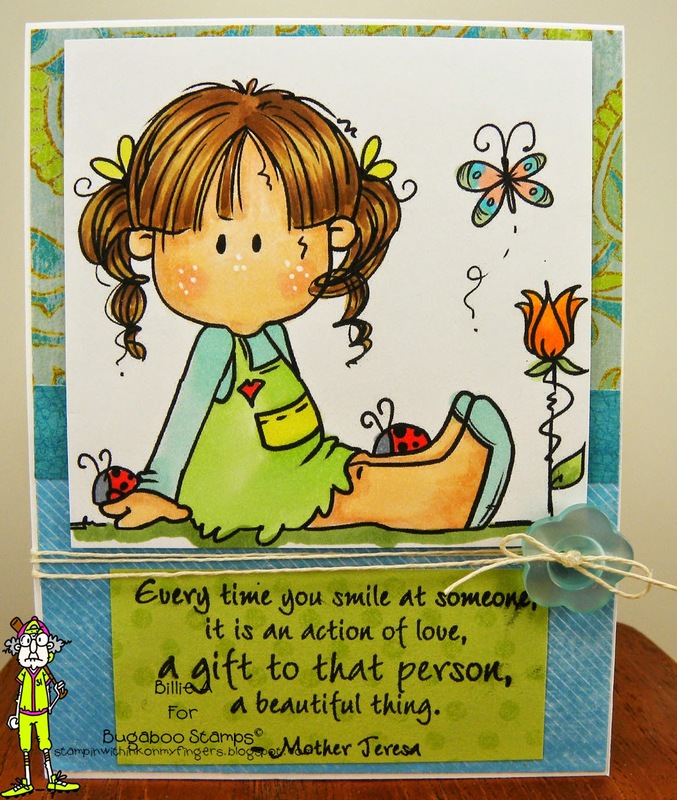 This is the darling image I chose to use from Delicious Doodles called Blossom. She was a lot of fun to color up, I also glittered up the winds to the butterfly. I really loved the colors I chose to use too. I also took the TWO (2) WORD SENTIMENT and embossed it on some vellum and colored it from the back side to give a softer look. I took some die hearts from Simon Says and added glossy accents on them. I hope you play along. Please remember to put the sentiment on the FRONT of your card. 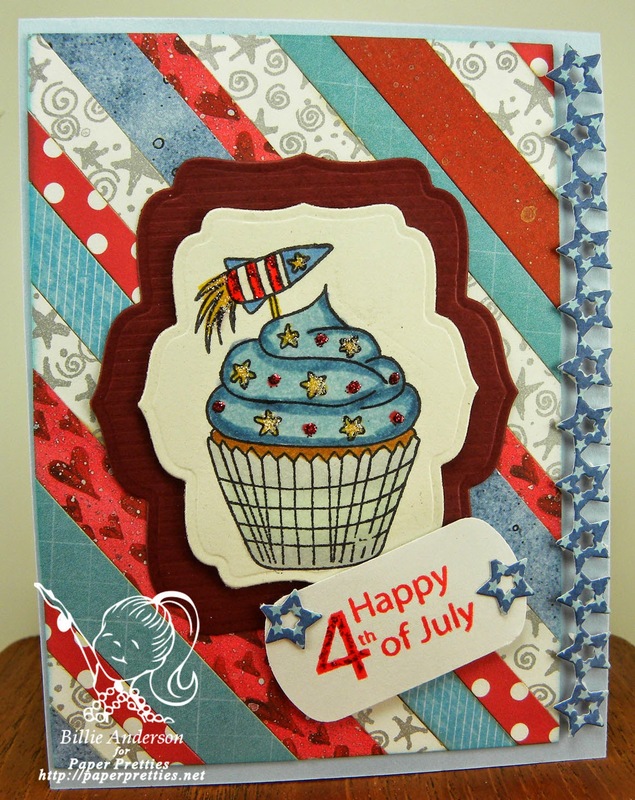 Paper Pretties #316 theme this week is RED WHITE and BLUE / 4th of July inspired card. I am not a fan of fireworks. I say it yearly. With living in the country and Weyerhaeuser country I know what they light off is not always family safety fireworks. When it shakes the windows and your neighbor is quite far away you cant tell me its a legal piece. Also the dry grasses that are around.. I just am not a fan. I don't mind going out to see them at a site that knows what they are doing that is fun. I used the sweet holiday stamp set and sentiment. I have been having fun using them. 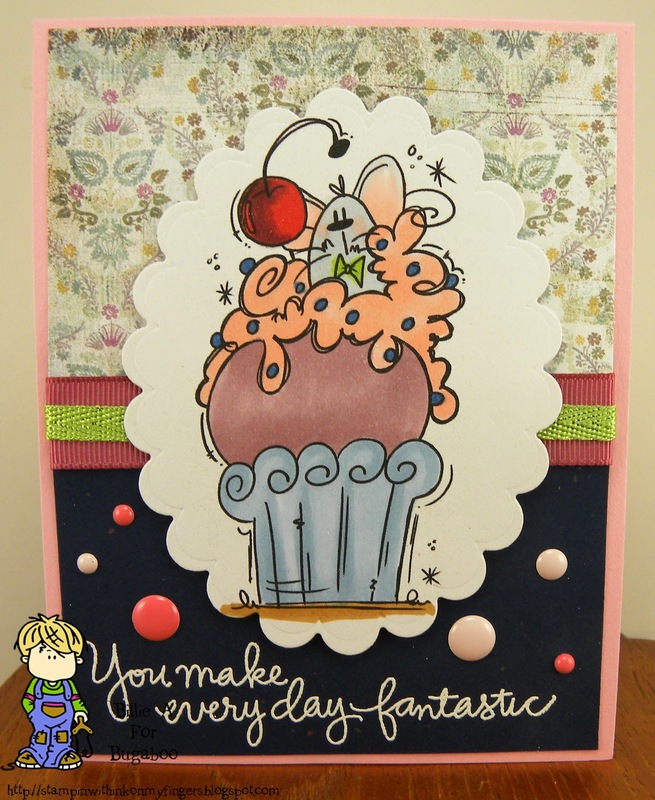 It comes with a couple of different cupcakes in the set and I have used the cupcake but taken the top little piece off of it on a few cards and just used the pretty cupcake for a different card and theme. Very optional set. For the background I just cut various papers and adhered them to a piece of white card stock then cut it down to the size I wanted. I have been doing this more often. Really helps to use up those scraps laying around that you just cant throw away. Give it a try. Cut different widths and make your own background. I love the little Brat kids they are always so cute. I love the little ladybugs crawling on her. I wanted to keep this light and bright and I had this awesome saying I won from Verse rubber blog so wanted to use it. I know she doesn't have a smile on her face but even without the actual mouth you can still see a smile on her face, she should being out in the sun having a picnic or just one with nature time. I hope you head over to Bugaboo and check out the new images and sometimes there are awesome savings. 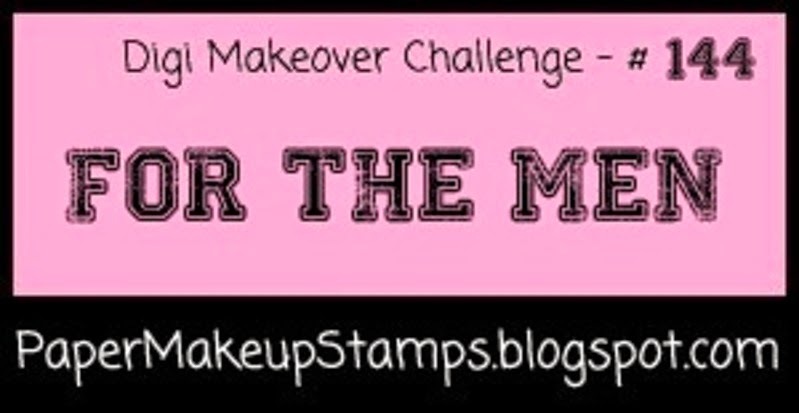 Check it out..
Paper Makeover #146 THINKING OF YOU.. 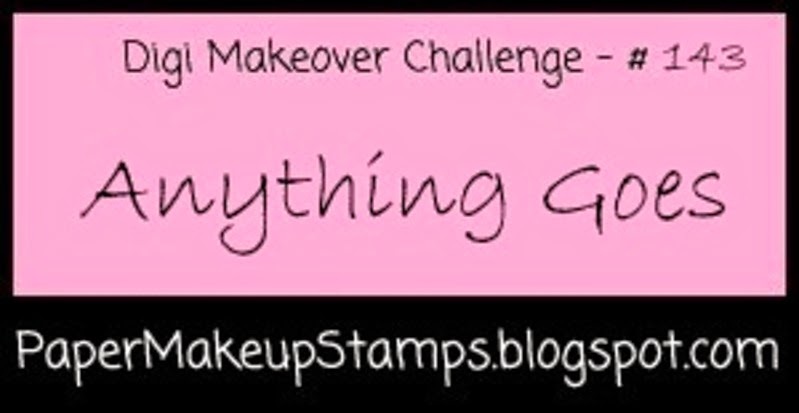 I hope you play along with our theme for this challenge. Remember to use a digi and use a sentiment. Just have fun and come along and play along, it's painless. Truly.. 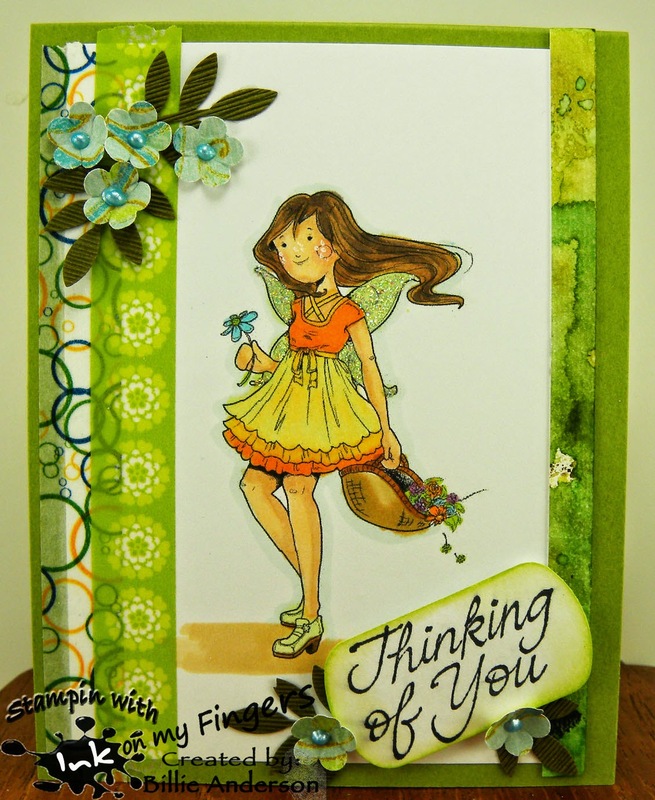 This is the card I made using Chelsea Fairy Paper makeover image. The sentiment is from art impressions. I used washi tape down the left side and a strip of water color paper w/ranger inks from a prior project that was left over.. I don't throw anything away.. I used su punch for the little flowers and ms punch for the leaves. 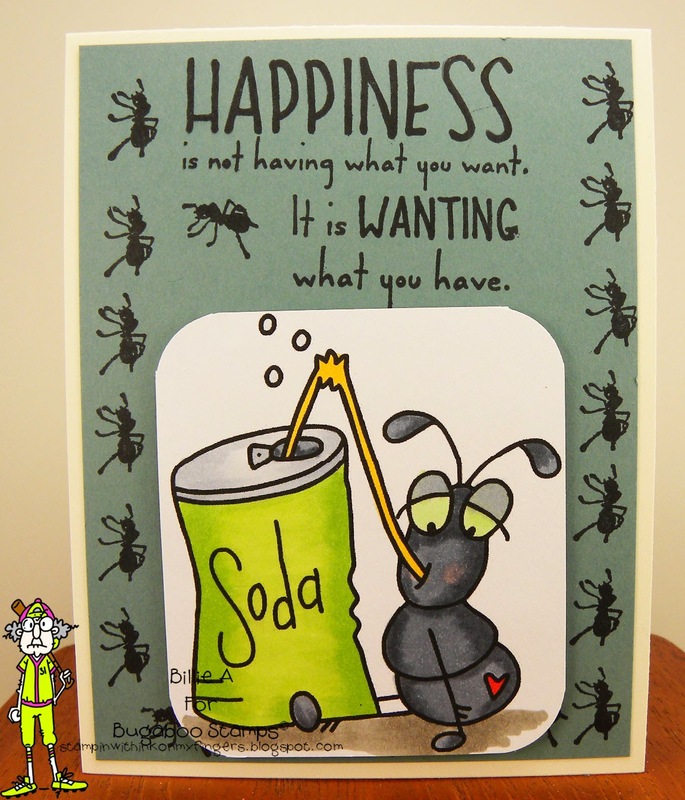 Well with summer coming the picnics and laying back with that soda can... the ants come marching along, yo ho, the ant's come marching along.. hence the pay on the trail of ants on the card and the play on words with this sentiment. (I really like this sentiment) I kept this kind of C&S. I think this is a fun card. This is a free image SODA ANT so I hope you get a chance to head over to the Bugaboo site and pick up the free image and a few other images.. Look at the June new releases.. best you cant just choose one.. LOL Could be a special over there too.. Take a look. 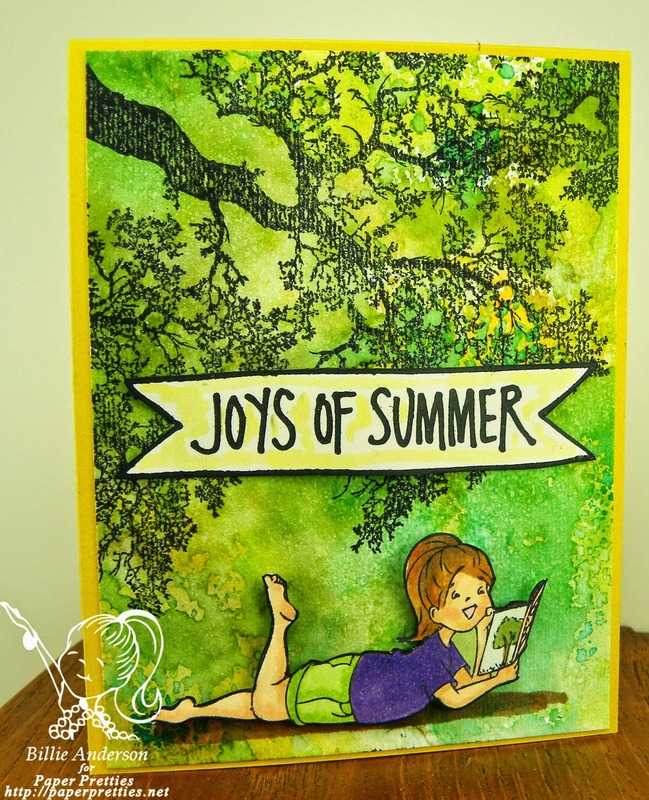 I am using the stamp set Story time Sophie who doesn't love to read under a nice shade tree during the summer.. or anytime. I love to read and have my kindle with me most of the time. I used water color paper and various ranger inks to give the background color and stamped a tree branch over the card to give a tree shade look. 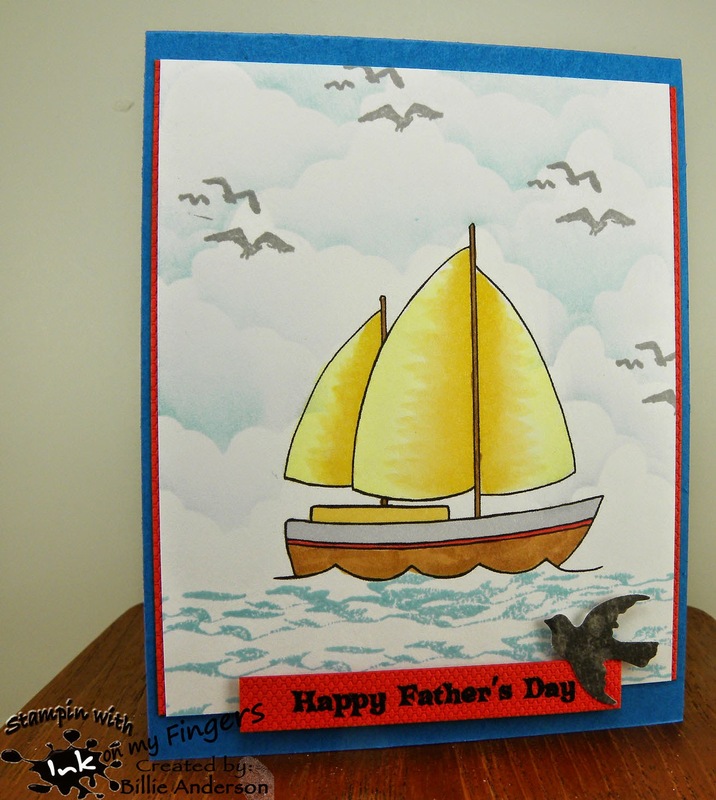 I used a banner stamp and sentiment to finish the card design. I stamped the image and cut her out and put the shadow under her. I hope you enjoy the inspiration this is meant to give you and you play along at Paper Pretties. 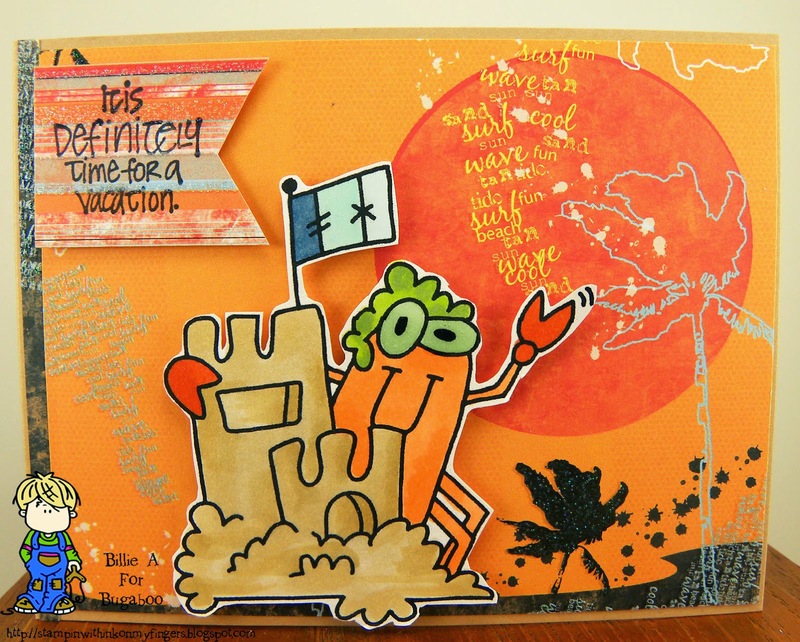 recipe: story time sophie / pp, water color paper, su base, ranger inks, hero arts ink, tree?, tech tues sentiment, copics. Well I am on my old /new computer, it's a desk top. I had this purchased this then got a lap top and have been using my lap top constantly and it has all of my crafting images, cards and challenges on it, in other words my life... Well yesterday we had dish come out to install Internet (we were with a slow server before) and all was working fine till about 9pm and my lap top had no more Internet. says it does but nada. it does not.. my laptop lied to me.. (go figure my hubby still has it on his lap top) so I had to use one of those scan sticks which took some time to get my card off the lap top onto the desk top. So far so good. I tried to remember some of the sites for challenges and use my blog to load some but it's just not the same as my laptop and handy. The repair guy will be out tomorrow so hope to have the lap top working tomorrow night and can add more challenges and be back to normal sitting on the couch watching tv and surfing the net.. This is the new release at Catch the bug/Bugaboo.. Sign it lil girl.. 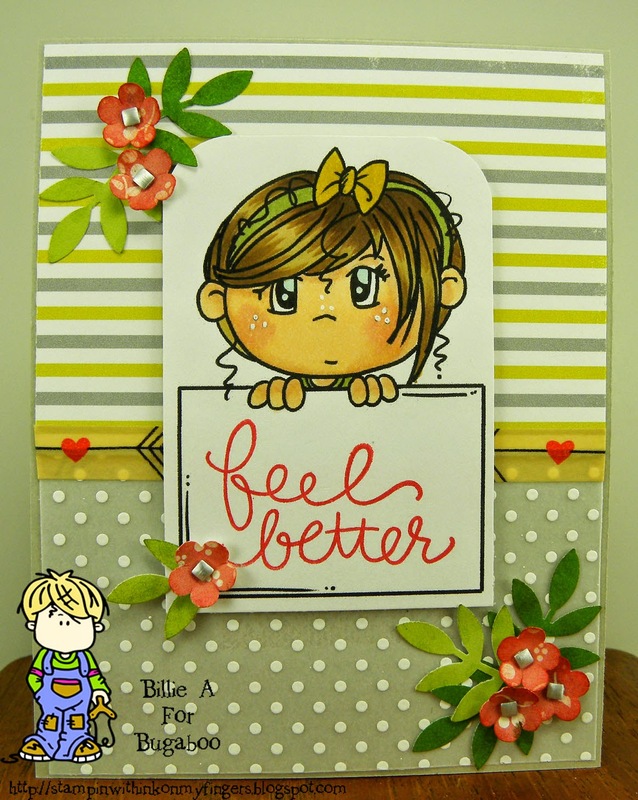 I thought she looked sad so I stamped inside "feel better" I tried to make the card happy..by using happier colors and had this awesome vellum with the dots on it for the bottom piece. Hay check out those flower centers they are little metal pieces and really makes the little flowers pop. Love the look. 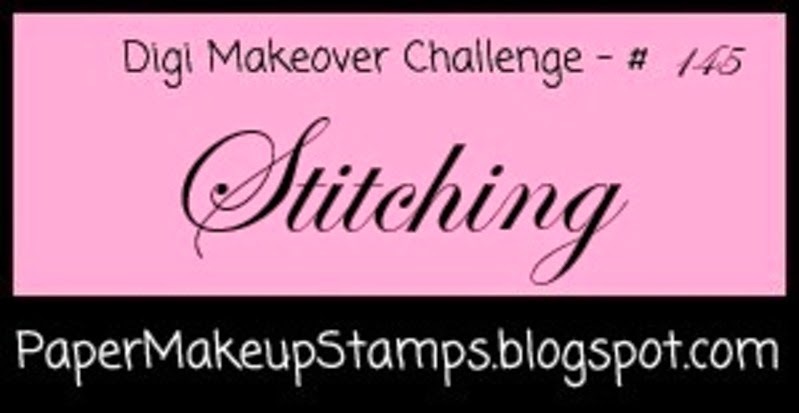 Remember to use a digi for your STITCHING challenge. We are a digital challenge site. This image is Lucy Mouse by Paper make over digi. Isn't she tu-tu cute .. I hope you play along and remember use a digi image!! Hay today is Friday the 13th.. ooooh who's worried?? Not me I don't believe it in but I tell you I am glad I am not at work today as I am on the phones all day and we always seem to get crazy calls around full moon time and with Friday the 13th on top of it.. oh man it's going to be a crazy day.. This is the card I made using the image. I thought with the water can image I would just put a hint of flowers on the background and on the other side of the card stock I used thin silver strips of washi tape. Isnt this the cutest think strips around. I love the look and I used a strip of other paper dp between the flower dp and the washi tape. Used the same paper for the sentiment. I colored the image with copics. If the image is not on site when you got over, please check back. Sometimes life gets a little busy and life gets in the way so it gets posted a little later than usual. The image will be there for a full week. Hope you enjoy. recipe: bird water can / bugaboo, su card stock, dp, washi tape, pti sentiment, copics, wink of stella glitter pen, ranger forest moss. 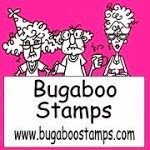 The sponsor for this two week challenge is Bugaboo stamps (who I am also on their dt ; ) and they have some awesome images so take a look. 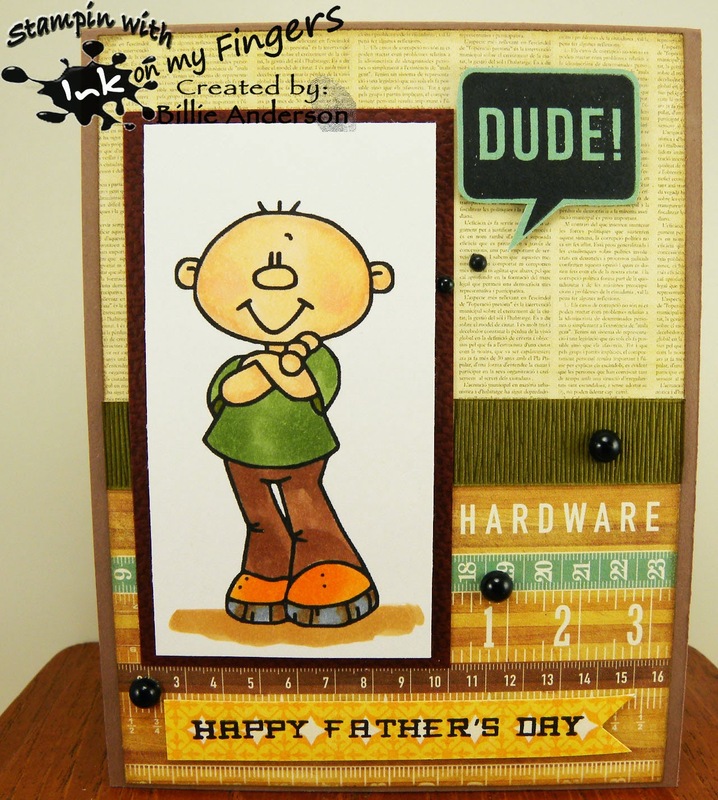 This is the Bugaboo image I used lil dude I like the look and decided to make a fathers day card since it needs to be a guy sentiment for our challenge. I also used masculine papers from Echo Park This & that. I love the way this card came out. It's perfect for that dad in your life. Make sure you use the guy sentiment on the front of your card. Paper Pretties #314 challenge is INVITATION - make an invitation card. 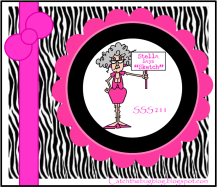 I used Frankie digi image I thought his look went great with the surprise party invitation. I loved the background paper to show it's a Happy day party.. so it could be a birthday, anniversary any kind of surprise party. This was a great fun card to make. I added the letter stickers to spell out surprise. I am loving this card. I just happen to have this sentiment and it fit perfect for the image. I think she is so cute and I used some eyelets which I have a ton of and never use. It felt good to get them out and my crop a dial and pop those little hearts on there. I added a paper clip to the top corner. When I thought of the robot being some metal I thought the paper clip gave it a nice look of metal. 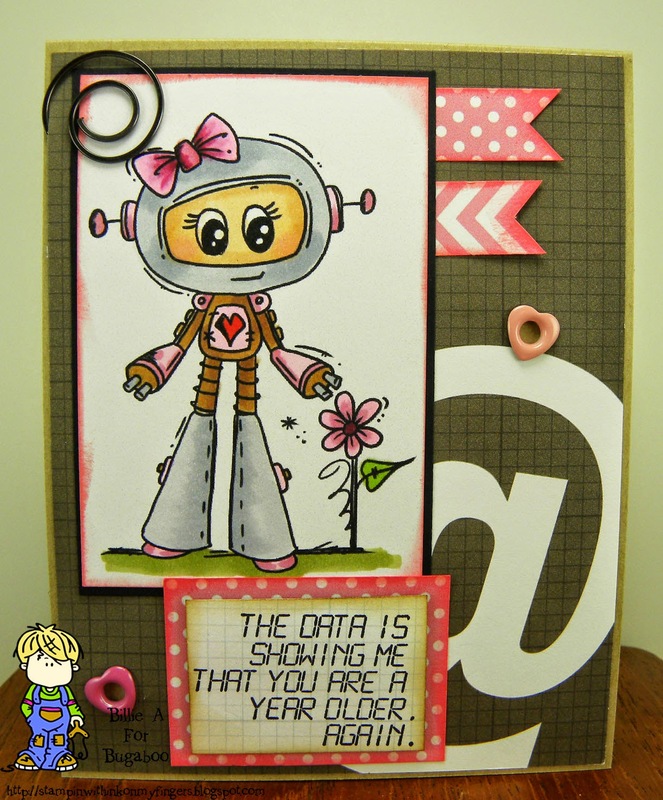 I used wink of Stella glitter pen on her helmet and legs. I love the color choice and the cute image. Hope you head over to the Bugaboo store and see the new images for June. 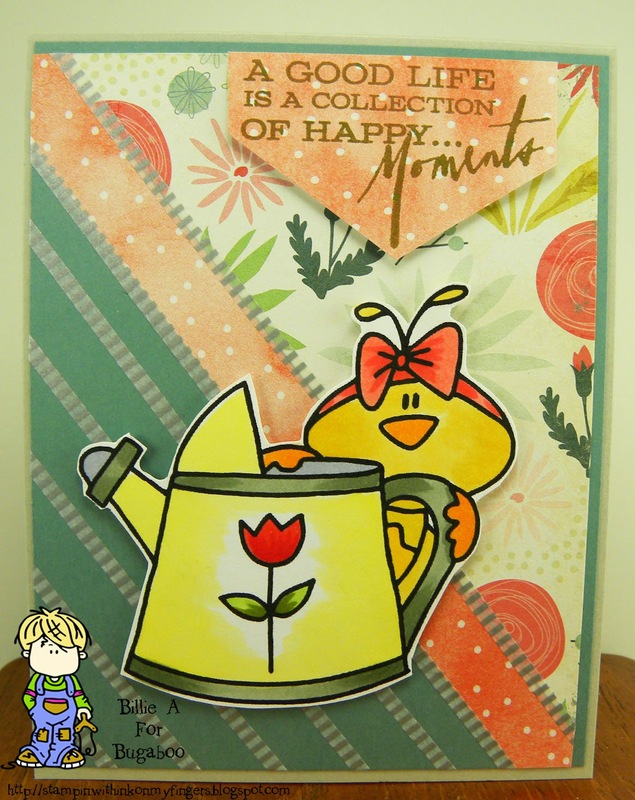 I had to use Stella /fire me digi and I was thinking when I made this card that it was for another challenge but I was looking at the wrong page. Yea that happens a lot.. 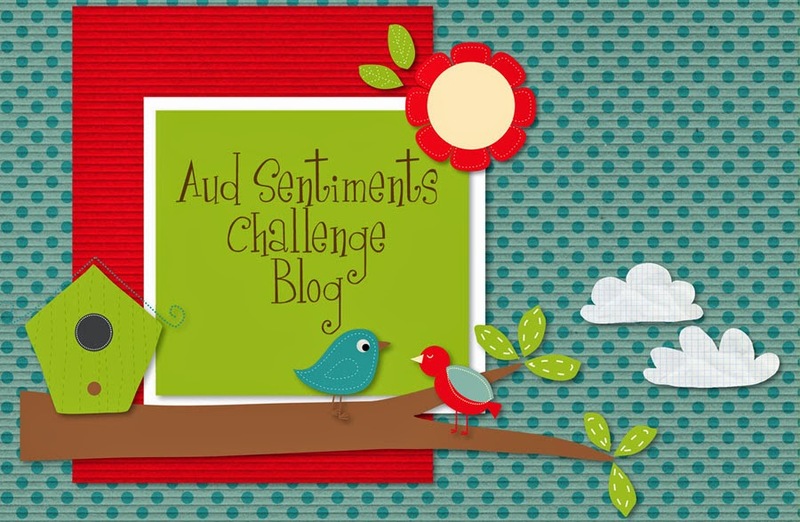 So anyhow I changed it up and made it for the ATG challenge. I just used the banners on the side and stickers to spell out the sentiment. 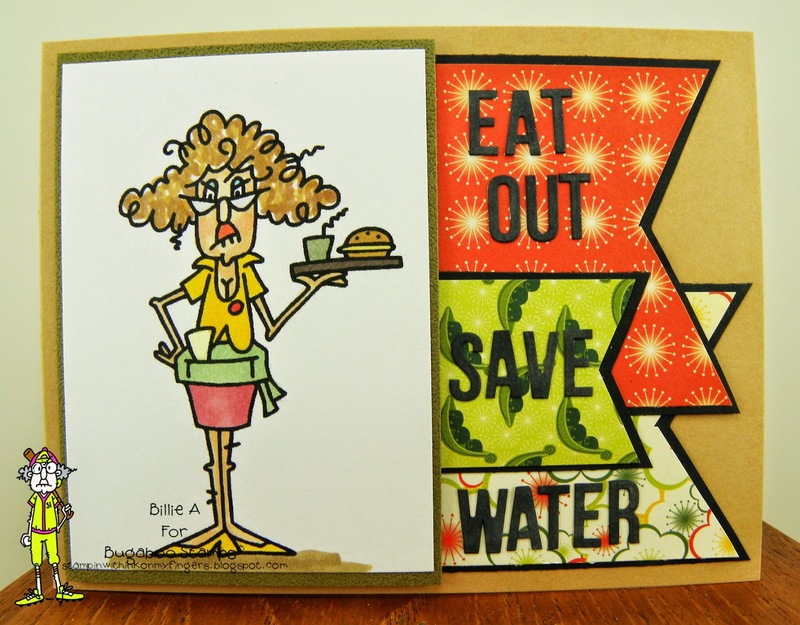 With summer coming so many states are saying to conserve water.. Eat out save water.. I hope you find time to play along over at Catch the bug. Woo Hoo it's Friday and that is so nice and Free Friday at Catch the bug / Bugaboo and we have Beach Crab.. I have this DCWV paper that is all tropical so used that for the background and cut out the image and popped it up on foam dots and added a banner flag sentiment. I added glossy accents to his eyes and a lot of wink of stella glitter pen to the sand castles so it looks like sparkly sand. In person it looks awesome. Square is not something I usually do so this was a challenge to make the card look right. 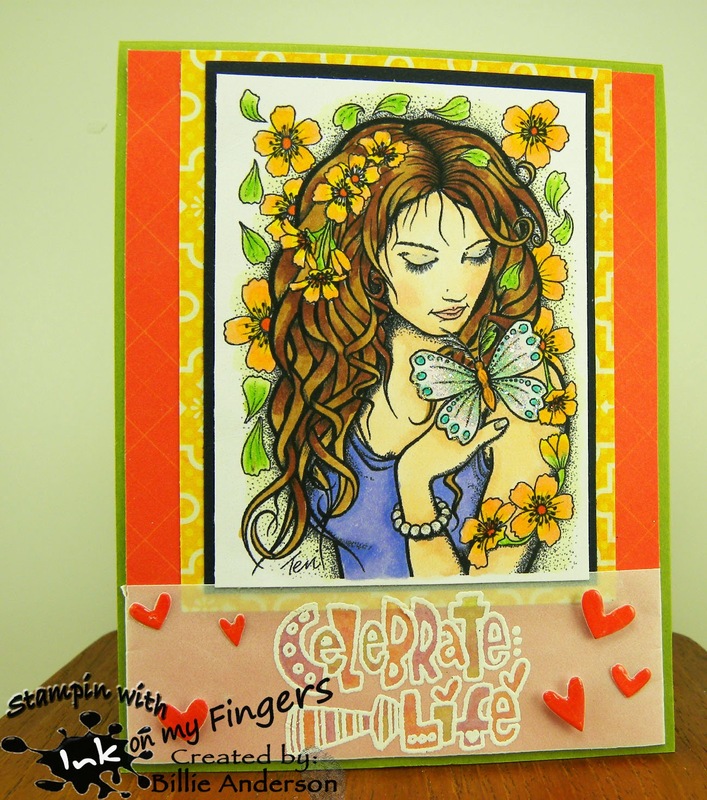 I stamped the image on this textured card stock and just used my copics to color it up. 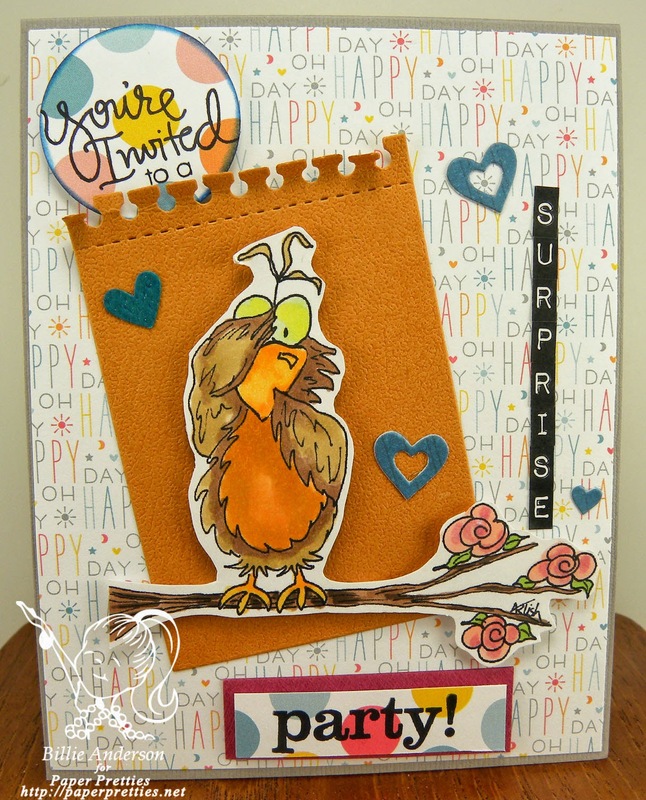 I thought using the yellow went well with the stork and made coloring the other images on the bird nice soft colors. I am happy with the way it came out. I thought adding the flowers to the top corner also announced that it was a boy birth card. 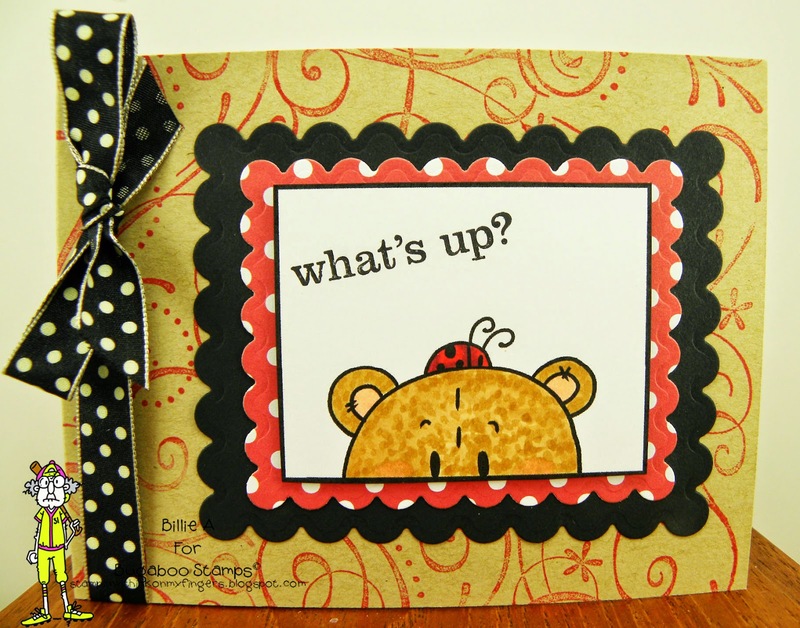 I am liking this square card and may need to make more. It's humor me Wednesday at Catch the bug and June 8th is Best friend day..
We all have a best friend right? I know I do. They are always the ones you can talk to and they listen and can advise or not, just fun to hang out with and craft with. Just that special person that warms your heart when you think of them. This is the card I made for using you are the best I thought that I would make the images larger than usual which left me with open space below so just added the banners to make up the open space and to give added colors. Today we have a darling little boy Kidz fishing boy. Reminds me of my boys fishing. They love going out squidding, trout, salmon any type of fishing. We could spend hours doing it, be it the lake or the sound it was all good. I loved being able to go with them and fish right along side them. Lot's of good memories. 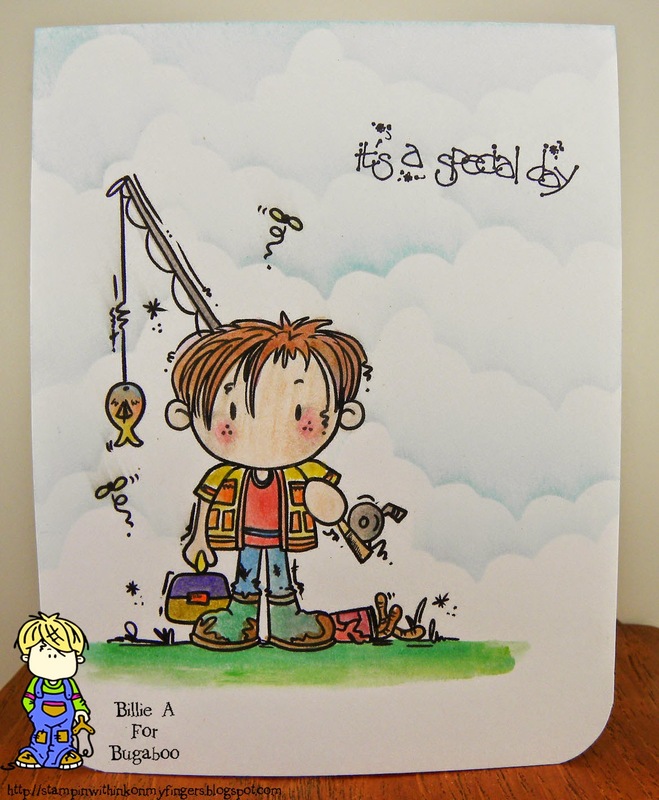 recipe: kidz fishing boy/ctb, eureka stamps sentiment, gp paper, inktense water color pencils, prisma pencils, corner chomper, ranger, my cloud template, hero arts black ink. 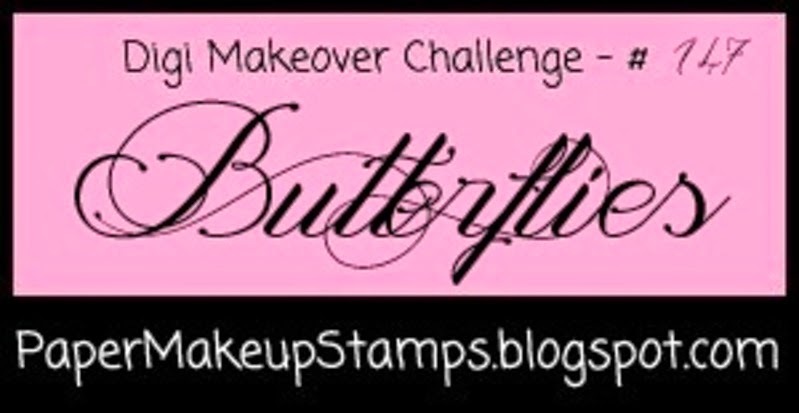 I hope you get a change to play along with this weeks challenge. Remember you must use a digi to play along. 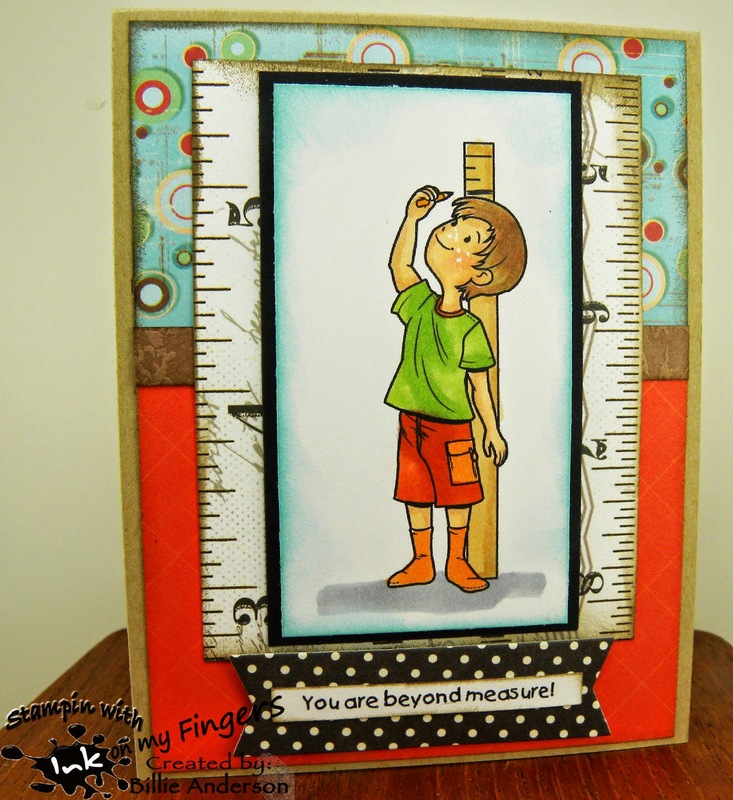 This is the card I made for the anything goes challenge using the image beyond measure boy/ I love this look and the cute image. 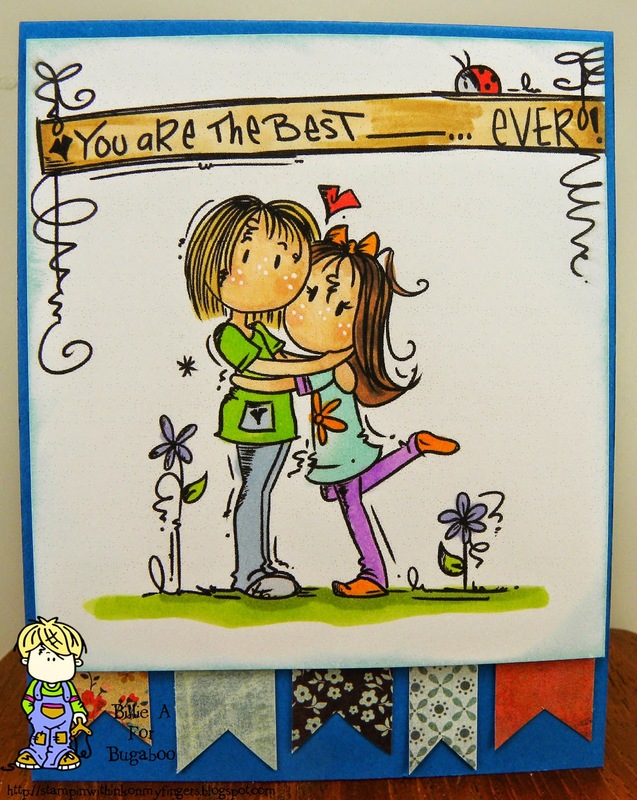 I had this left over ruler paper from Quick Quote which was perfect for this card/image. 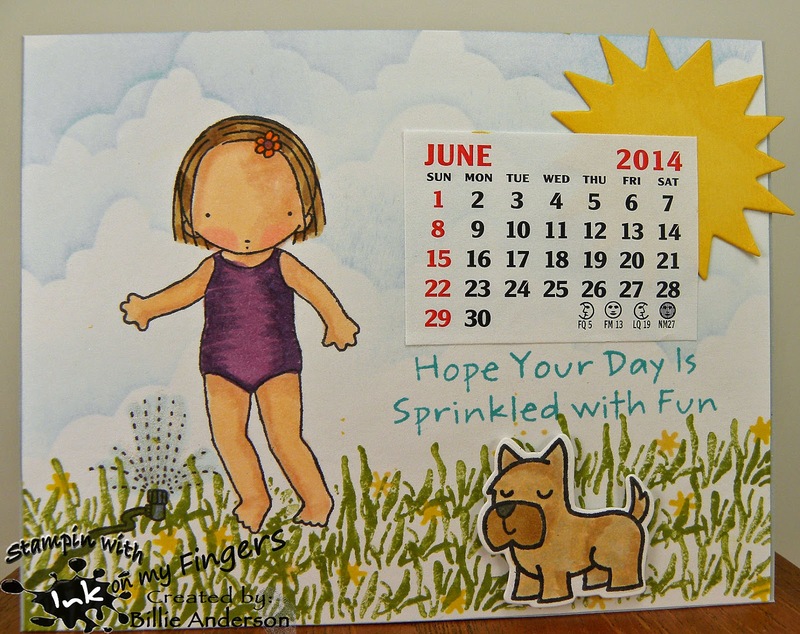 Hello I've posted a couple card and this calendar page today so I hope you check the other posting out. My dear crafting and bff got me started with a group of girls she knows from Wisconsin who each year we do calendar pages. I want two calendars, one for home and one for work so I do two months. I did March and June. I already posted March in March.. duh...;) so now it's time for June. This is one of 12 pages all the same. This photo was taken before I sent it to Wisconsin for binding into a calendar and joined with the other months to make the year calendar. It is so nice to see a different awesome new page each month and get to enjoy the other persons work of art. I love that you get the whole month to enjoy it. Catch the bug SSS #211 / What's up? This is the card I came up with using the above sketch. I really did not want to use a background designer paper so used my jumbo su wheel and just rolled the image on the kraft. I used the image Teddyb1 (he comes in a set of three) what a cutie little image huh. The other two are just as cute and different poses.